“A qué se dedica?” asked our guide. He and I were riding our horses along the beach behind the group and talking about life. He wanted to know what I did for a living. “Soy piloto,” I answered with a smile. I shrugged and grinned back. Then I urged my horse forward and galloped down the beach past the rest of the group as they plodded along in the sand. It was our last day in Costa Rica, and I was going to squeeze a few more drops of excitement from the adrenaline-filled trip. I wanted one more day of Pura Vida. Pura Vida is a common expression in Costa Rica. Literally translated, it means “Pure Life,” but expressions like that can’t be taken too literally. Pura Vida means a “good life,” “full of life,” or “living great.” On our second trip to beautiful Costa Rica, I was starting to understand what the “Ticos” meant. When my wife Britt and I began planning a trip to celebrate our 25th wedding anniversary, Costa Rica was high on the list. We had enjoyed a trip there before a few years ago, and always wanted to go back. When we did some comparisons based on cost and available activities, we decided that another trip to the land of Pura Vida was in order. It is considered a professional standard for pilots to be cheap. I had deviated from that standard slightly when I purchased Britt a first-class ticket for the trip, but I redeemed my image by jump seating (at no cost) myself. It was a good balance. We traveled with two other couples, Kelly and Leroy, and Kim and Glen, and because of separate bookings, we traveled in two groups. I almost got left at the gate in Phoenix because of a paperwork snag, but in the end my friend Lori (who was flying the Airbus) helped me work it out, and I boarded. After a night in the Adventure Inn, an adequate hotel with friendly staff, the guides from Pacuare Lodge picked us up around 0545 the next morning. We piled into a small bus and headed out into the mountainous rainforest east of San José to embark on our first adventure – whitewater rafting. Heavy with people and luggage, the suspension of the bus bottomed out on the rough road. We visited with Pepe, one of the guides, and exchanged riddles in Spanish until we ascended into the clouds and stopped at a restaurant for breakfast. We ate the typical breakfast of eggs with black beans and rice as the fog swirled and obscured our view. The adventure began when the bus started down the steep switchbacks overlooking the swollen river. Everyone grew quiet and prayed the brakes were better than the suspension. Pura Vida! We piled out of the van with a few pale faces and grabbed a helmet, a paddle, and a life vest. My helmet was adorned with blue scuffmarks like someone had smacked it with one of the paddles. I wondered if it was a sign of things to come. Ivan gave us the safety briefing, but I wasn’t as attentive as I probably could have been. It’s hard to think safety when your bladder is full and the sound of rushing water is all around you. While he was giving us the briefing, one of the departing rafts capsized and dumped everyone out. I checked the water. It was cold. When we finished the safety briefing (and took a potty break), we shoved off with our guide José Luís. His English was good, but not as good as his smile and good humor. José Luís put Leroy and me in front. That made me nervous. I was going to get soaked. Sure enough, as we pushed through the first rapids, I got soaked. After that, I relaxed. I figured that getting wet was most likely the worst thing that would happen to me that day. Pura Vida! We laughed and enjoyed the spectacular scenery. The gigantic tropical trees along the river supported several canopies. The river was the color of coffee with cream because of the recent rainstorm, and even though the water was cool, it felt good in the warm tropical sun. When we stopped to explore a stream with a waterfall, we must have looked like some flock of strange exotic birds with bright orange shirts, white helmets, and red life vests. “Do we need to worry about wild animals?” asked Kim. José Luís shook his head and smiled. “Just esnakes,” he said with a laugh. We kept our eyes open. After braving several rapids and learning to paddle together, we arrived at Pacuare Lodge nestled in the rain forest along the edge of the river. When we hung up our wet gear and sloshed up the riverbank to check in, Andrés welcomed us with a pot of hot chocolate. While we sipped at the chocolate and dried off he told us about the facility. Only the main building has electricity and Internet. The teakwood bungalows sit on stilts overlooking the river and come equipped with running hot and cold water, but no electricity. When we walked up the wooden steps onto the porch with a hammock and a river view, it felt like a slice of paradise in the wild. Each open-air bungalow was furnished with a king-size canopy bed and a gorgeous bathroom that included an outdoor shower surrounded by a stone wall for privacy, if you wanted to shower al fresco. I felt like I was taking a shower under a hot waterfall in the middle of the rain forest. Pura Vida! At Pacuare Lodge meals are served for everyone at the same time with a set menu. If you think that just because you are in the middle of the rain forest the food might consist of fruit and reconstituted foods, you are mistaken. Lunch was a three-course meal. For dinner I had a spicy tomato soup that was out of this world, followed by tilapia with rice, and passion fruit mouse for dessert. For breakfast the next morning we had eggs with bacon, fried cheese, and banana pancakes. If that wasn’t enough, Leroy talked them into to bringing us a plate of oatmeal cookies after dinner, and they offered coffee and hot chocolate in the afternoon. We ate so much the raft sat a little lower in the water when we shoved off the next morning. The second day on the river was even better than the first. We traversed several good rapids and paddled through lush forest vistas with waterfalls cascading down cliffs. A friendly competition emerged among the paddlers on each side. Leroy started giving his side grief for not paddling hard enough, and then talking smack when it appeared they paddled better than us. When I asked José Luís if we could change sides, he hesitated, and then very diplomatically told me in Spanish that he didn’t want to switch because it would make it uneven. He said that he put my group on the side opposite of him because Leroy’s side was weak. It was fun translating that. The smack talk continued, especially when we went through a big rapid and I held up my paddle and cheered instead of paddling. We laughed and cheered each time until at last we passed under an old railroad bridge and pulled out next to their company warehouse. Pura Vida! After we showered off and changed into dry clothes, we caught our transport to Tabacón. We had originally had scheduled for two rental cars, but switched to private transfers instead. It was cheaper, and a much better way to travel. We were able to take short naps and visit while someone else familiar with the roads drove us to our next stop. One driver, Pablo, even offered a wifi hotspot through his iPhone. It made the trip a lot less stressful. The Tabacón is a five-star, hot springs resort built at the foot of the Arenal volcano near La Fortuna. It offers luxurious rooms with rainforest and volcano views. Across the street is a hot springs river surrounded by a manicured rainforest with a spa in the middle. They also offer a swim-up bar where the pool is slightly warmer than bathwater. Up above the entire complex is a restaurant that offers a nightly buffet. I think the first guests here were Adam and Eve. After a good night’s rest and a buffet breakfast, we headed for Sky Trek/Sky Tram, a zip line adventure in the foothills surrounding the volcano. Once again we donned helmets for safety and boarded the tram. Glen had expressed his concerns over the event several times, but when he saw a seven-year old boy on the tram, he swallowed his fear and manned up. After the obligatory safety briefing and two practice zip lines, we hooked up to the first cable and past the point of no return. I stood on the platform trying to look past the trees and see where I was going. Then the signal came over the radio, and the guide pushed me off the platform. The next thing I knew I had zipped past the trees and was soaring almost six hundred feet in the air! The wind rushed by and the pulleys on the cable hummed as I felt something akin to flying. I felt small against the backdrop of the volcano, the lake, and the sprawling forest. The tiny platform on the other side looked like a beacon of civilization drawing me in. I slid into the platform with a grin on my face and braked to a stop with the help of the friction devices. Since I was the first to go, I was worried that some of the others would chicken out, but when I stood on the platform and filmed their arrival, all of them had the look of exhilaration on their faces, especially Glen. When we finished I told Britt I wanted to be a zip line guide in Costa Rica when I retire. Pura Vida! The hot springs of the Tabacón balanced out our adrenaline-filled morning. We relaxed under steaming waterfalls and wandered from secluded pool to secluded pool soaking in the hot mineral water and letting the tension of paddling the raft and the adrenaline of flying high above verdant forests on a steel cable melt away. That evening we dined at the buffet, and reported to the spa for a couples massage. I am not a regular massage customer, and for Glen it was another first. They escorted each couple to a private area behind the spa nestled among the trees. I could hear the rushing water of the river mingled with soft meditative music as I lay on the table letting the masseuse push all the cares of the world from my body and mind. I was able to let the rhythm of my thoughts settle and pick up a cadence that carried me to clarity. Pura Vida! If soaring through the air wasn’t enough, the next morning we headed out to rappel down waterfalls with Pure Trek Adventures. At this point my fellow travelers accused me of trying to kill them. It was our fourth day in Costa Rica and everyday we had participated in something that required a helmet. I just smiled. After a short drive up into the mountains in the back of a truck that reminded me of being in the military, we filed out and got fitted with our rappelling gear – including the helmet. Having rappelled several times, but by no means an expert, I took special note of the gear, the ropes, the anchors, and the belay system. By the time I saw the set up at the first 165-foot waterfall, I was satisfied that we were in competent hands. Once again, Britt and I went first. They made me wait as I watched her scurry down the cliff beside the rushing water. When they gave me the green light, I found my rappelling legs quickly and began catching up with her. Suddenly the guide on belay stopped me and pulled me into the cool rushing water of the falls for my morning shower. We high-fived each other, and stood at the bottom cheering on everyone else. The guides followed the same pattern for the next few couples until Kelly and Leroy started down. After dousing Leroy in the waterfall, they decided to pull the already-terrified Kelly into the waterfall as well. That induced a kicking and screaming fit, and when she finally got to the bottom she punched the mischievous guide in the shoulder. (See video below.) By the time we finished the fourth waterfall, Glen was over his fear of heights and Kelly was a pro. Pura Vida! After another afternoon in the hot springs, and a very sound sleep. We started our longest travel day from the center of the country to the Pacific coast to Manuel Antonio and the town of Quepos. We took in the countryside, a butterfly observatory, a fruit stand, and watched crocodiles fight over pieces of meat - not exactly the same as driving across Kansas. When we checked in at Costa Verde, we were ready for some down time. 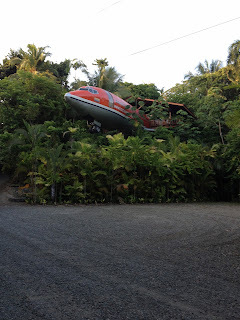 Costa Verde hotel sits on the hillside above the beach and offers spectacular views, including a B727 that has been converted into suites. They boast that they still have more monkeys than people, and true to that slogan, we saw several monkeys during our stay. At dinner across the street in La Cantina we contemplated the remaining activities and decided to cancel our guided tour to the national park the next day. Instead we would rent scooters and spend the day on the beach. Then the last day we would go horseback riding. In the process of helping a fellow traveler, I spoke with Fabricio Mengarelli, the executive chef of La Cantina. Right away I noticed his Argentine accent. We ate at his restaurant two nights in a row. The ribeye was excellent, and my wife said the pineapple chicken was out of this world. If you are ever in Quepos, go see Fabricio. Pura Vida! To start our “relaxing day” on the beach, we rented scooters. Of course, that meant putting on a helmet. We zipped down to the beach and got snookered by the parking attendants alongside the road, but when I left the keys, I must admit they were honest, and brought them to me. We overpaid for chairs and umbrellas, drinks and burgers, boogie boards and a ride on the banana boat, but Leroy used his negotiating skills to secure us some time on the wave runner unsupervised. Between boogie boarding the nice easy waves, wrestling with the wave runner, and getting thrown off the banana boat several times (I could not stay on! ), we topped it off with a game of soccer on the beach with the locals. By the time we scooted back to the hotel, I was exhausted! Pura Vida! After dinner at La Cantina, we hopped on to our scooters and zipped down into Quepos to Escalo Frio in search of ice cream. We found the ice cream, but while we were there we heard the rain start pounding on the tin roof. It was coming down in buckets with no end in sight. We got the ladies a cab and sent them back to Costa Verde. While we waited for the rain to subside, Leroy and Glen sampled the pizza, but I was too stuffed with ribeye to eat. When it became obvious that the only way we were getting back was through the rain, we fired up our scooters and charged back up the hill amidst the lightning. Cold rain pelted my face and pinged off of my helmet, but I was grinning from ear to ear. Pura Vida! Kim was worried about horseback riding the next day, since it would be her first time. The horses were small and looked like they could use some more oats, but they seemed docile enough. It turned out they were maybe a bit too docile, except for mine. The guide was an experienced horseman that paired us up with a horse based on our experience, and how we acted around the animals. I got the horse that wanted to run. While everyone else prodded their horses into a trot along in the sand, I got my horse to gallop circles around them. After all the adventures we had completed by then, we were jaded. What should have been an enjoyable ride on a beautiful beach, turned into a slow trot in the sand. We had officially become adrenaline junkies and needed more than a simple ride along the beach to impress us. As the end of the ride came in to view, I spurred my horse into a run and galloped to the finish. That afternoon it rained. We ate pizza again and took a siesta. When the rain subsided that evening, Britt and I went for another ride on the scooter. The undulating hills along the beachfront took us in and out of pockets of cool air. We scooted along the deserted road looking for monkeys. The moist wind felt good on my face. After twenty-five years, my wife’s arms still felt good around my waist. Pura Vida! If you want to book an exciting vacation of your own to Costa Rica, contact Catalina - info@crreferrals.com. She can help you find your Pura Vida! Britt loves the Britt Shop!